Kajitsu means "fine day", or "day of celebration" in Japanese. We have chosen the name Kajitsu hoping that a visit here will always be a special occasion for our guests. Shojin cuisine refers to a type of vegetarian cooking that originates in Zen Buddhism. each component, with the finished dishes beautifully arranged on plates. The shapes " " were sketched by the Zen monk Sengai Osho (1750-1837), to illustrate one of the most essential principals of Zen: the journey to bring meaning out of something that seems to have none. At Kajitsu we use this symbol to show our respect for Zen philosophy and the traditions of shojin cuisine. 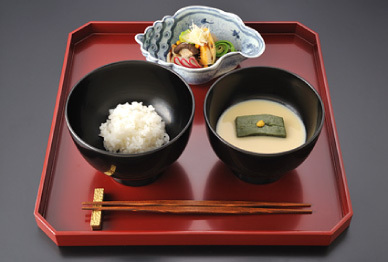 In traditional Japanese cuisine the dishware is an integral part of the meal. master Japanese potters over 200 years ago as well as works by modern ceramic artists. and for the shojin tradition of frugality and respect. Copyright Kajitsu All rights reserved.